Ambassador Tim Fischer, Emeritus Ambassador of Australia to the Holy See, delivered a keynote address at the Catholic pre-conference, ahead of the 20th International AIDS Conference in Melbourne. “Faith based organisations contribute much to health and well-being in nearby places such as Papua New Guinea and I salute this vital work,” said Ambassador Fischer. Speaking about Saint John Paul II, Pope Emeritus Benedict XVI and Pope Francis, Ambassador Fischer highlighted that these Popes have contributed much on various fronts that make up the Christian fabric of the world. He also stressed that although there has been progress in fighting AIDS, this does not “reduce the need and importance of pushing on”. Highlighting the longevity and magnitude of the AIDS epidemic, Ambassador Fischer stressed the vital role that faith-based organizations play in restoring health and well being to communities and cited the Vatican statistic that some 25% of all HIV services in the world are sponsored by the Catholic Church. Since 1987, Caritas Internationalis has included HIV work and advocacy as one of its priority issues for reflection and action by its General Secretariat and its 164 national member organizations. Ambassador Fischer thanked Monsignor Robert Vitillo, Head of Caritas Internationalis (C.I.) delegation to the UN in Geneva and special advisor on HIV and AIDS, for his fruitful work at Caritas Internationalis, which spans more than three decades. Other speakers at the opening session included Archbishop Philip Wilson of Adelaide, President of the Board of Caritas Australia and Mr. Paul O’Callaghan, Executive Director. 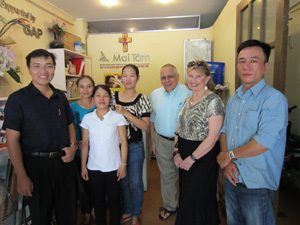 The event also marked the fiftieth anniversary of Caritas Australia. Some one hundred people engaged in the worldwide Catholic Church response to the pandemic of HIV joined this event. In addition to Ambassador Fischer’s Keynote speech, the Catholic pre-conference includes presentations from Father Richard M. Bauer, MM, the Chair of Catholic HIV and AIDS Network (CHAN); renowned scientists, including Professor Suzanne Crowe, the Associate Director of the Burnet Institute; Dr. David Cooper of St. Vincent’s Health System, Australia; Dr. Stefano Vella, of Italy; Dr. Julio Montaner, of British Columbia, Canada; as well as UNAIDS Regional Directors, Dr Steve Kraus, the Asia/Pacific Region, and Dr. Sheila Tlou, Eastern and Southern Africa Region.